With its energy-saving power supply and ECO DECT technology, the Gigaset S810A consumes less electricity than its competitors, making it kinder to the environment AND your wallet. Paired with the RTX Repeater, this bundle is an unbeatable deal with extra-long range, so you can use your phone anywhere, be it in the office or at home. Multi-tasking has never been easier! Enjoy the freedom of hands-free flexibility both in the office and around your house, thanks to Bluetooth technology. The Gigaset S810A can easily be connected to a wireless Bluetooth headset, so you can enjoy the freedom of talking hands-free while continuing to work at your desk. 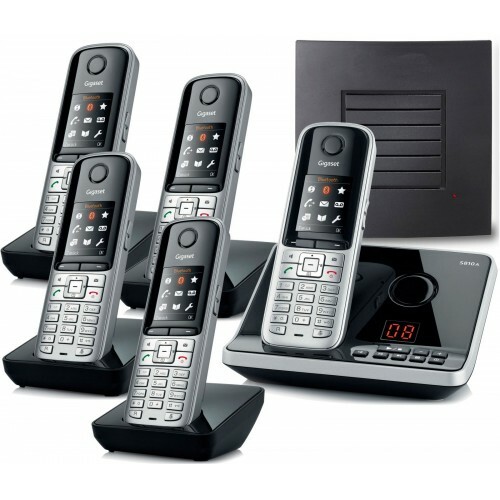 The S810A’s integrated digital answering machine has loads of great features, including up to 55 minutes of recording time, an LED message counter, and a useful skip-back function that lets you repeat the last few seconds of previous messages in case you missed an important detail such as a phone number.